Did a Vermont pastor get sentenced to prison for refusing to marry a gay couple? By Keely Herring on Thursday, July 16th, 2015 at 4:58 p.m. This story appeared on the website NewsExaminer, but it doesn't check out as real. 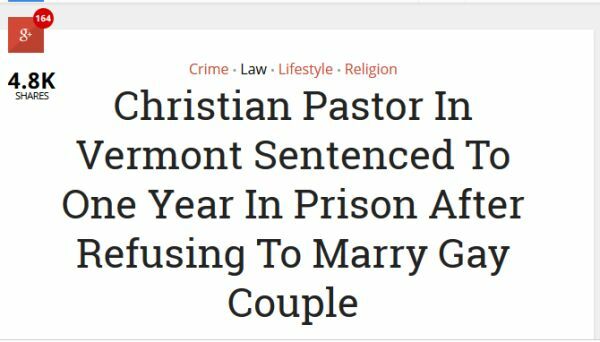 Perhaps you have seen in your social media feeds an article headlined, "Christian Pastor in Vermont Sentenced to One Year in Prison After Refusing to Marry Gay Couple." It received about 5,000 Facebook shares as well as interactions on other social media platforms. Is it real? We decided to take a closer look. But the bottom line is that the NewsExaminer is a fake-news site, and has been classified as such by Snopes, the urban legends site. Through a posting to an NBC copycat website with the url www.nbc.com.co, the article gained traction through mistaken association with the genuine NBC News site. The article cites several individuals involved in the case, but none seem to exist. The Hon. Myron Danus, the judge who supposedly made the ruling, is also fictitious. We checked the Vermont Court Administration Office in Montpelier, the U.S. District Court in Rutland County, and the Rutland County District Court to check if there is any judge by that name in the state, and there isn’t. Though the LGBT Pride Center referenced in the article is real -- or at least there is an organization with a similar name -- Gwen Hawkins, the supposed president of the organization, does not exist. Instead, the Pride Center of Vermont lists Kim Fountain as its executive director. We also couldn’t find a record for the Vermont Family Research Committee or its purported president, Steve Shand. There is one element of the article that is accurate: The town of Proctor exists. It is a small town in Rutland County, Vt.,with a population of just under 2,000. It is, as the article accurately says, "home to the Vermont Marble Museum, and the only marble bridge in America." However, the Christian Proctor Church is as fake as its pastor. According to the Proctor Town Offices, the town has only three churches: St. Dominic’s, Union, and St. Paul’s. Posts about a Christian pastor in Vermont being sentenced to one year in prison after refusing to marry a gay couple have circulated on the Internet. However, the article was published at a known fake-news site, and we found no evidence to support the existence of key elements of the story, including the pastor, church, or the judge referenced in the article. We rate this claim Pants On Fire. Published: Thursday, July 16th, 2015 at 4:58 p.m.
NewsExaminer, "Christian Pastor in Vermont Sentenced to One Year in Prison After Refusing to Marry Gay Couple," July 10, 2015.